t*rexes and tiaras: Friday Favourites 069..
Something a little different this week. I've put a wishlist together completely from House of Fraser, as I wanted to take part in their Denim Blogger Challenge. It couldn't really be simpler, all you have to do is put together a denim look. Now, we all know that jeans are not my thing. I have tried them in the past, but have never really felt comfortable in them. So I went for this denim dress by Closet as the starting point for my outfit, instead. I'd feel much more comfortable in a dress, and the lace detail at the bottom of this one is really cute, so makes it a little more dressy than, say, a denim pinafore would. Next up, the shoes. I was browsing for something a little different, and the sparkles on the black version of these Aldo sandals caught my eye to begin with. Then I saw that they came in red. Yay for red and sparkles! I think the glitter gives them a little something extra, which I think would make the dress suitable for evening wear as well as day. The red Mango blazer, I decided to match to the shoes. The fact that it has the perfect circus-style ringmaster look about it just gives it extra points in my book. You'll see where this is going. I know I'm usually a bit more clashy in my outfits, but I had to keep the basic elements fairly plain so as not to detract from my favourite thing of all. OhmyGod. This necklace. Possibly the prettiest Les Nereides necklace I've ever seen. Scrap that, the prettiest necklace I've ever seen, ever. I think it would work so well against the denim of the dress and I don't think I'd ever get bored of all those cute little circus people. I would wear it every day. Would you wear this outfit? I'm definitely going to put the necklace on my Christmas list. What's on your wishlist, this week? This is a really beautiful outfit, I love the red accents! so lovely wish list!!! I want this dress! Oh my God, that necklace is amazing! Shame about the price tag, because I love it. Loving the dress, too. I love your choices! I didn't see the dress when I was looking. 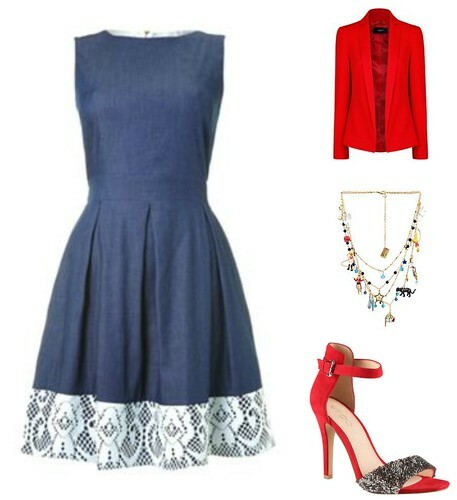 I really like the whole ensemble, especially with the necklace, which is very you, (I also might want it too)! And you glitter and you glimmer and you bark.. Direct me to my dinner..
Don't wanna fall into the sea alone.. I got soul but i'm not a soldier..
Sunday Shoes 026: Irregular Choice Kirby.. It's a game of give and take.. I really love your tiger feet..
Let the great wardrobe refill commence. It never rains, it pours..
An artist's grasp of insecure..